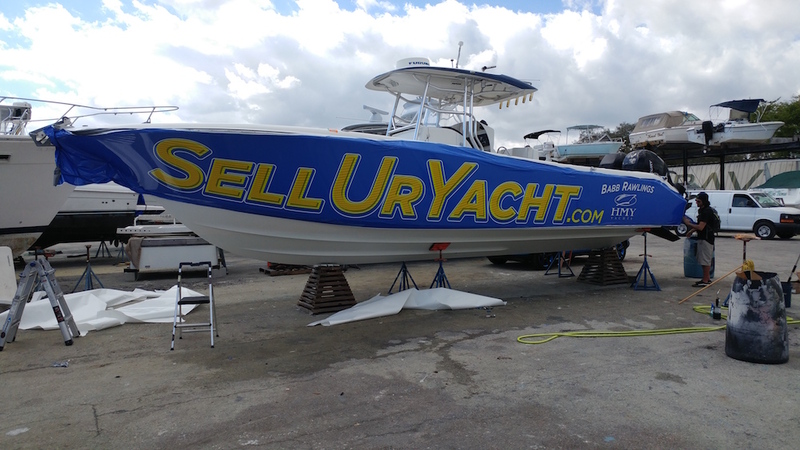 Customize and Protect Your Boat. 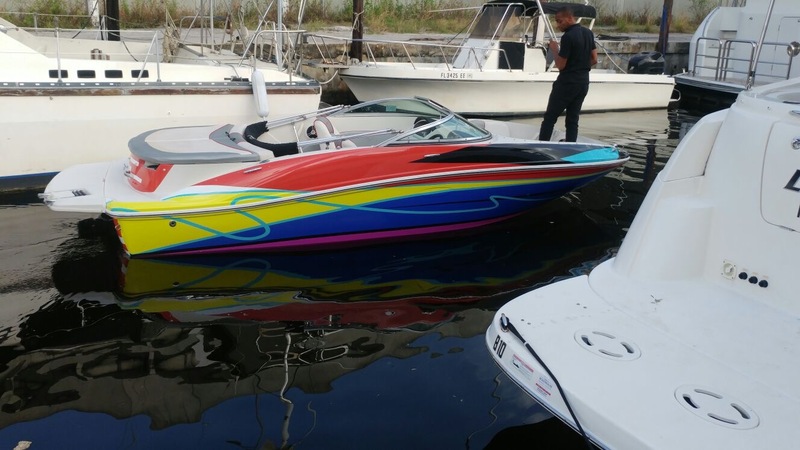 color change wraps + boat decals + custom boat graphics + more. 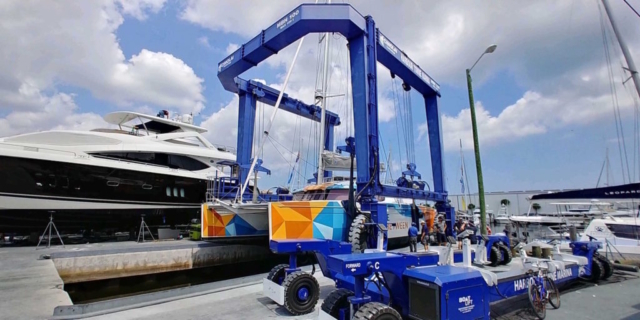 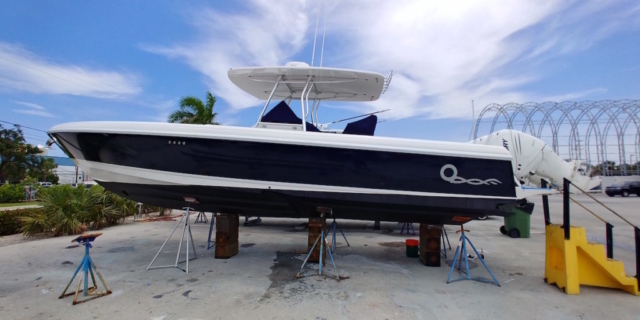 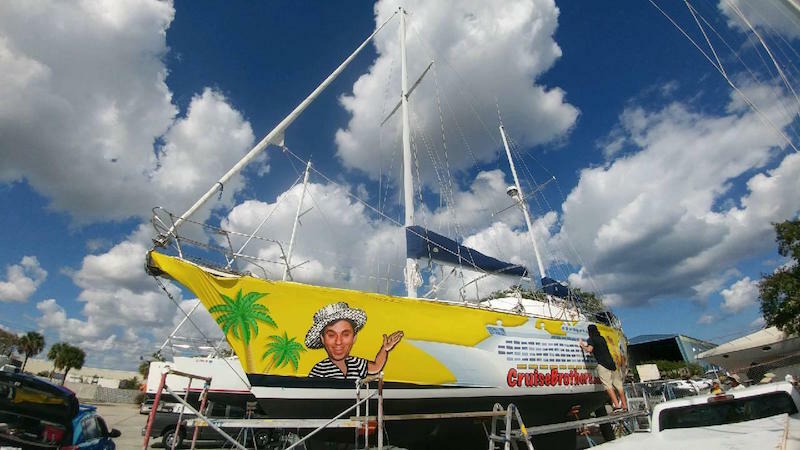 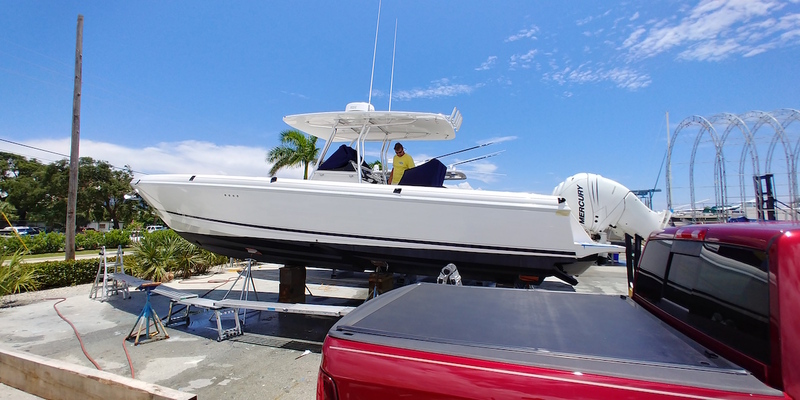 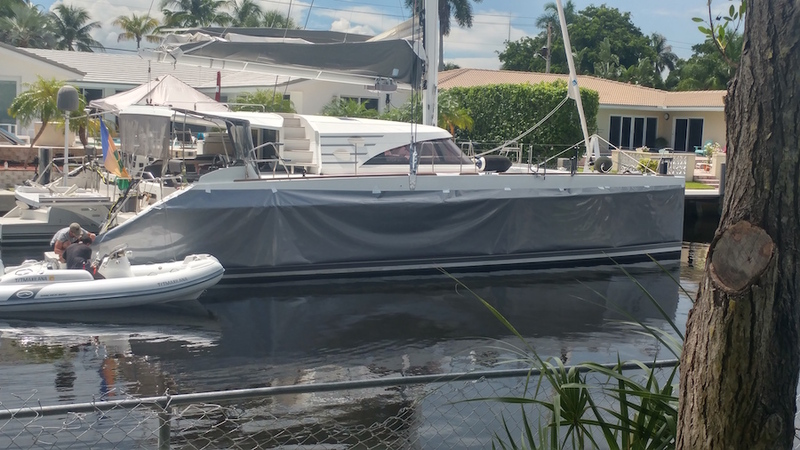 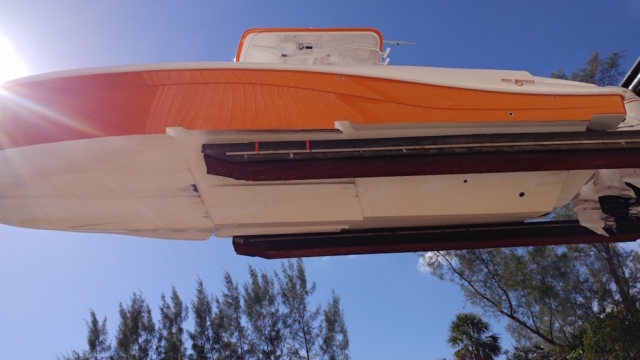 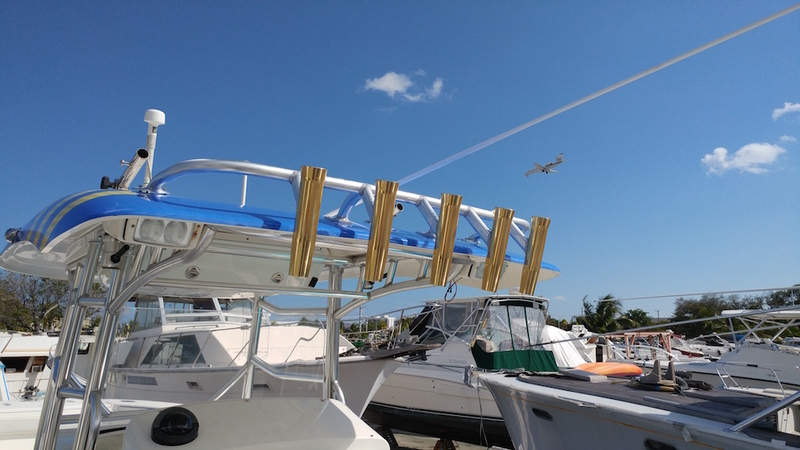 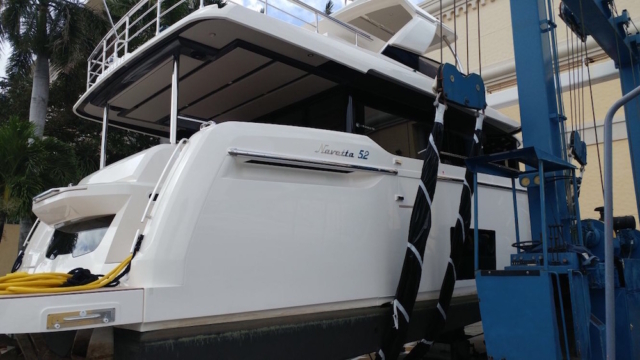 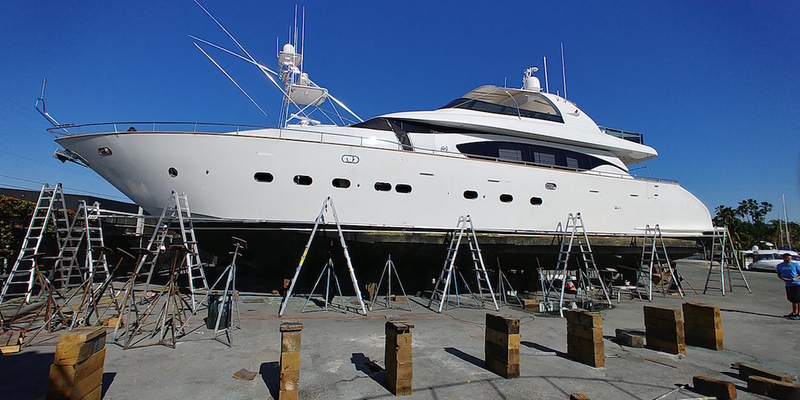 As vinyl wrap experts, Marine Wraps, based in South Florida, specializes in producing and installing vinyl boat wraps and custom vinyl graphics. 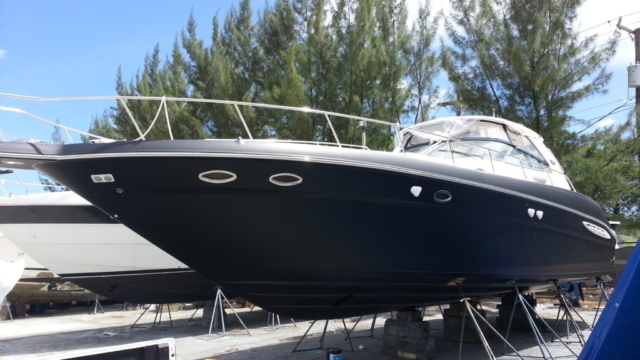 We serve Fort Lauderdale, Miami, Florida Keys, and other South Florida areas. With over 15 years in the vinyl wrap industry, we have mastered the art of vinyl wrapping, from production to installation. 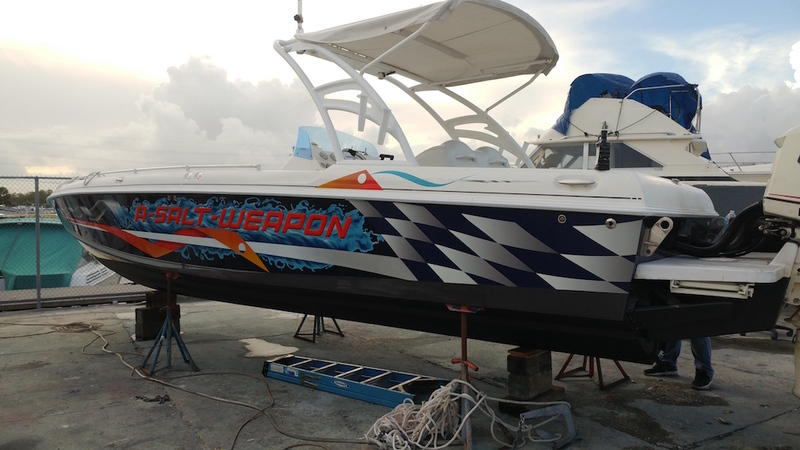 We have designed, printed and installed custom vinyl wraps and graphics on an extensive amount of marine craft and vehicles, including yachts, fishing boats, jet skis, speed boats, trucks, SUV's, high end vehicles, aircraft, and other watercraft. 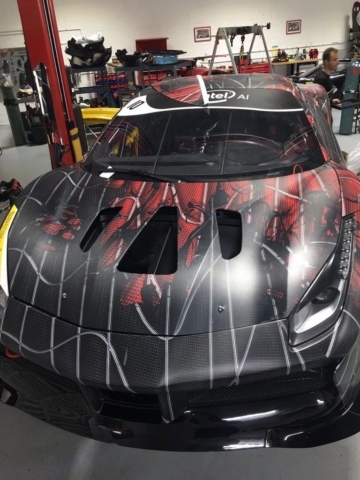 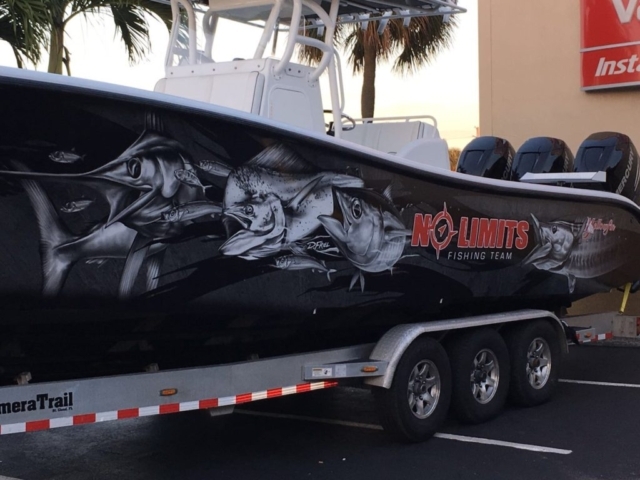 If you are unfamiliar with what vinyl wrapping and graphics are for a vehicle or a boat, click here to learn more. 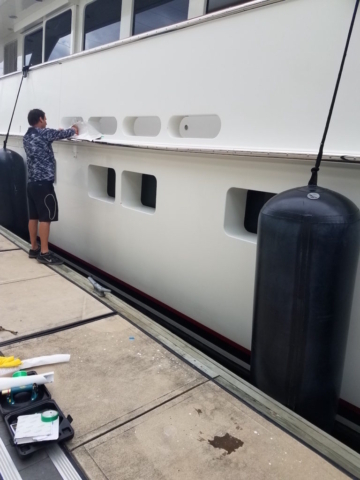 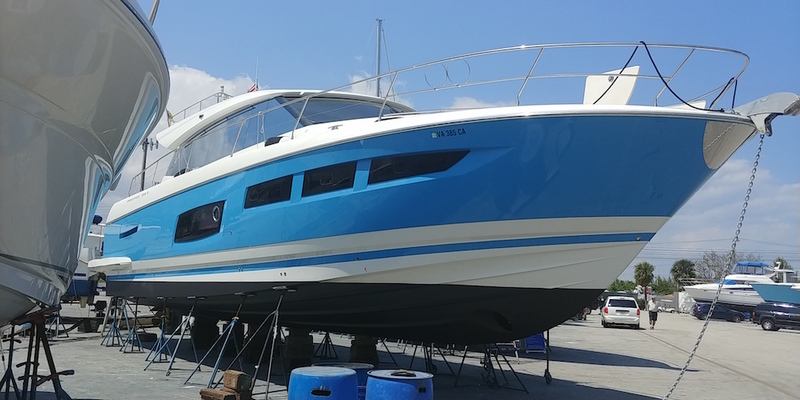 Our specialized boat wrap installation process will create a custom and unique feel for any style of boat, yacht or marine vessel. Our high quality materials, inks, industry techniques, and experience set us apart from the rest. 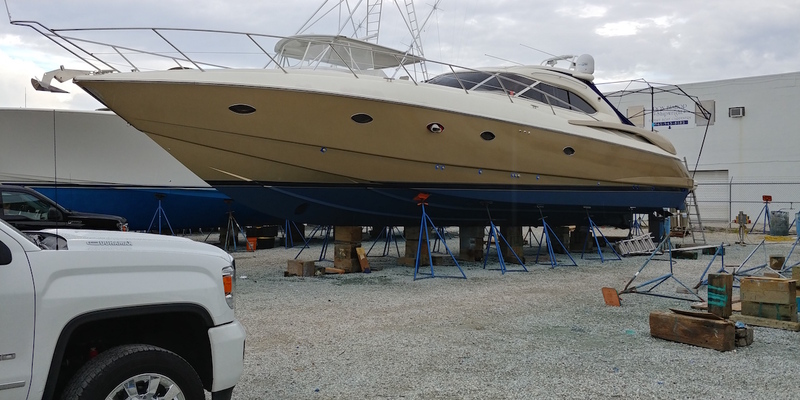 We say that because we are confident in what we provide. Change the color, add stripes, add decals or logos, or have our designers create an entire custom boat graphic. 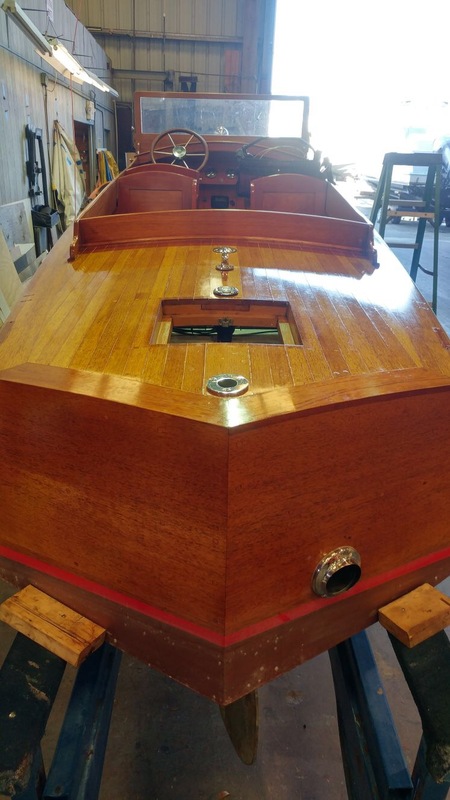 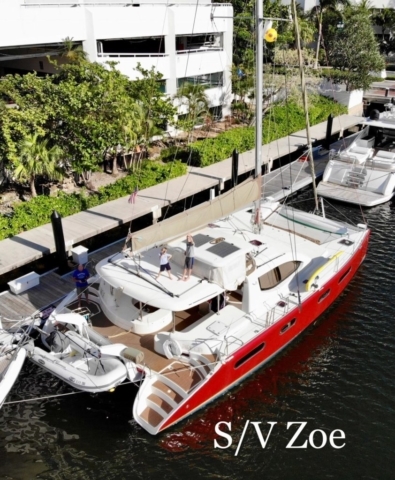 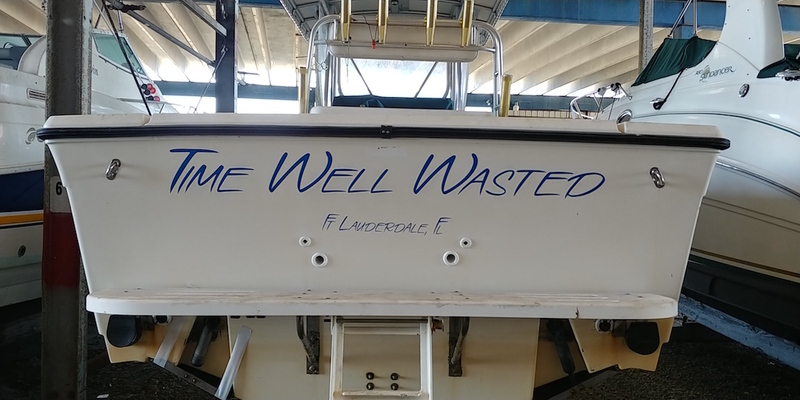 Utilizing the highest quality vinyl manufactures in the industry, and expert installation techniques, we will turn your boat into a work of art. 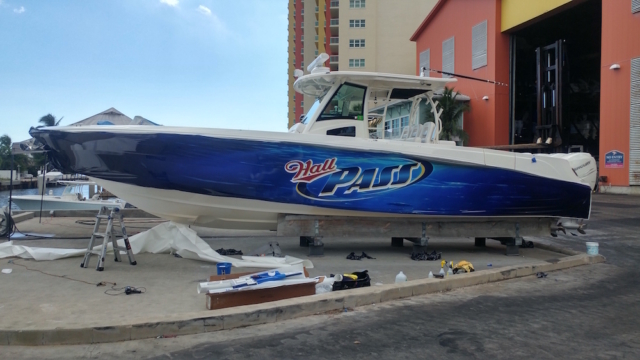 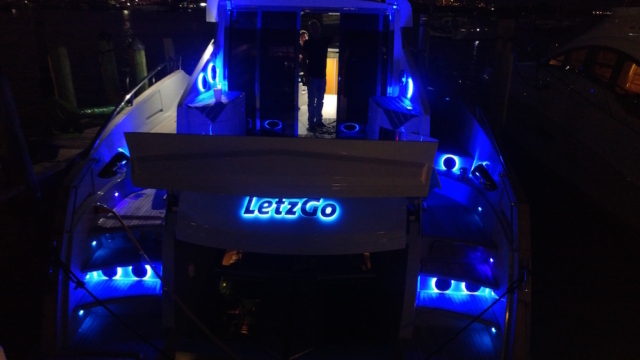 Our boat wraps are done with only the highest quality materials the industry has to offer. 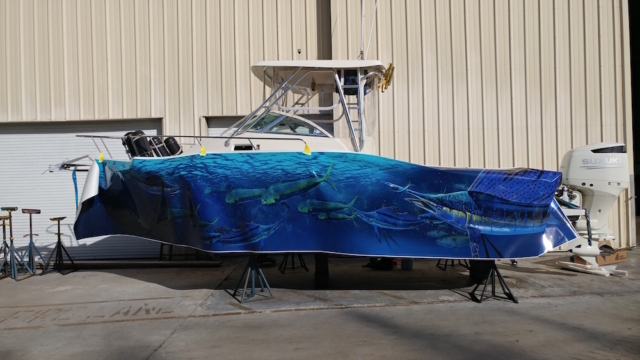 Our designers can create a custom boat wrap that will impress everyone on the water. 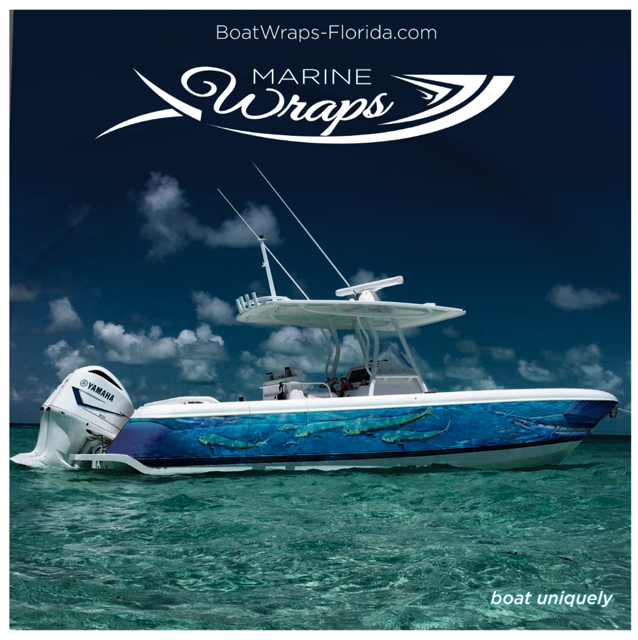 Marine Wraps, is our sister division of Vehicle Wraps 1, our long standing, reputable vehicle wrap company. 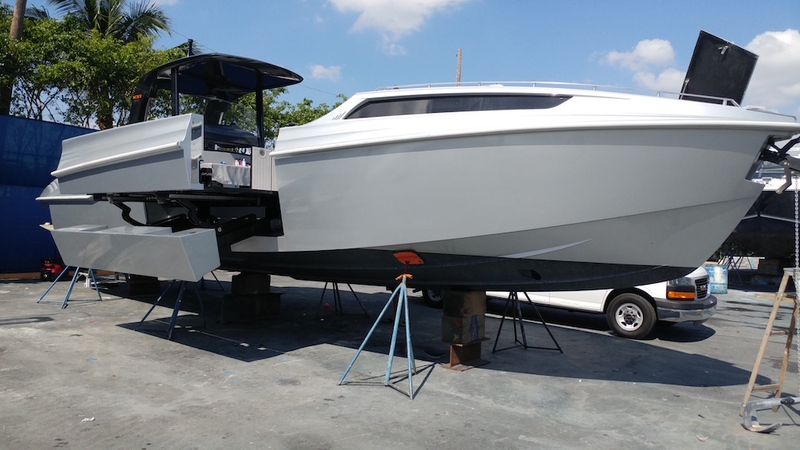 With the benefits of boat vinyl wrapping brings, along with the number of boats we were wrapping, Marine Wraps was born. 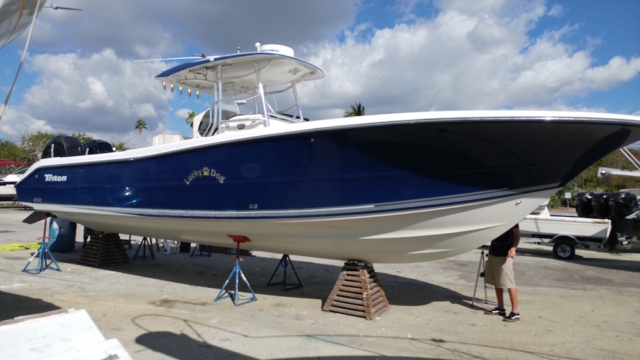 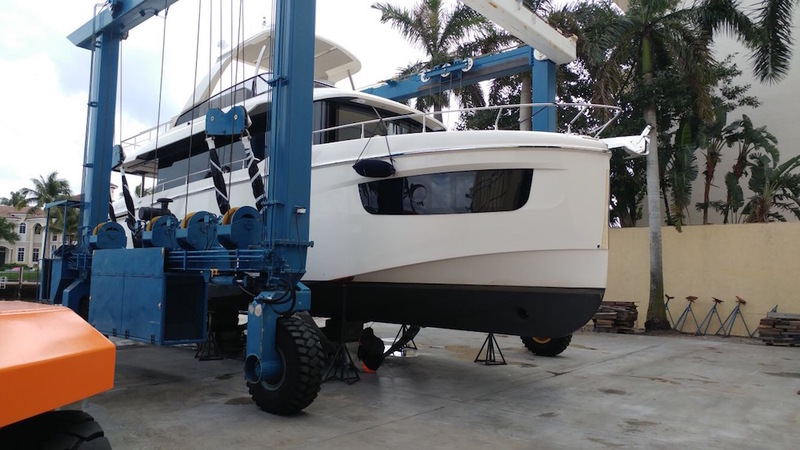 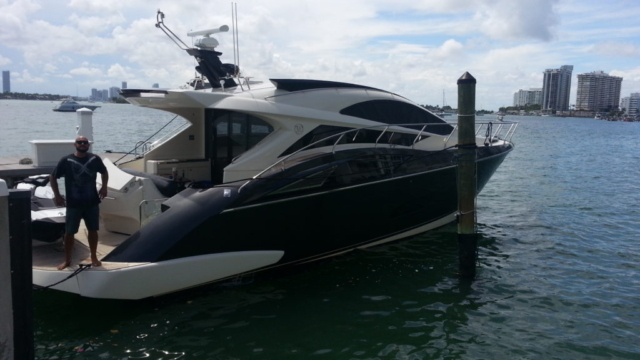 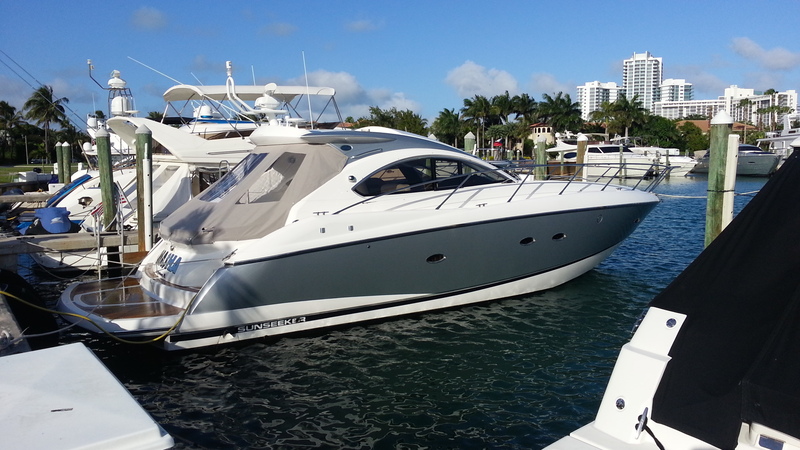 Our focus with Marine Wraps is to bring the very best in designing and installing boat wraps in Florida. 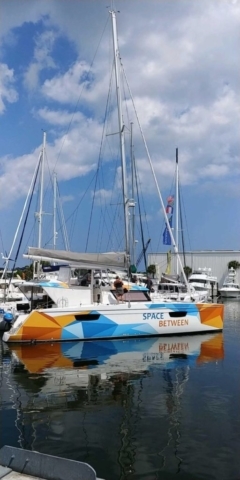 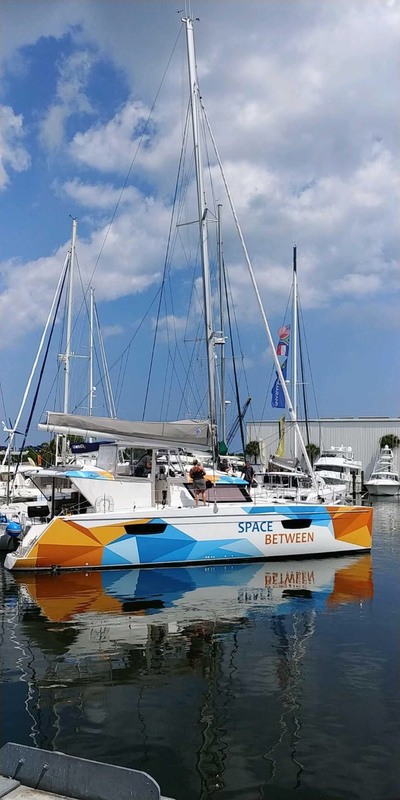 Boat Wraps and graphics are ideal for many styles of marine vessels including, yachts, fishing boats, leisure boats, and other watercraft that travel Florida waters. There is fine attention to detail and specific techniques that make a marine wrap last and stand out. Our in house graphic designers, high quality large format printers, and veteran installers allow us to customize each boat wrap we design, print and install. 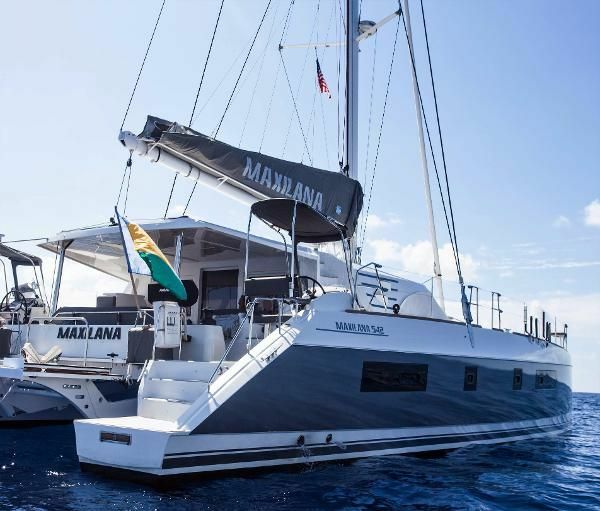 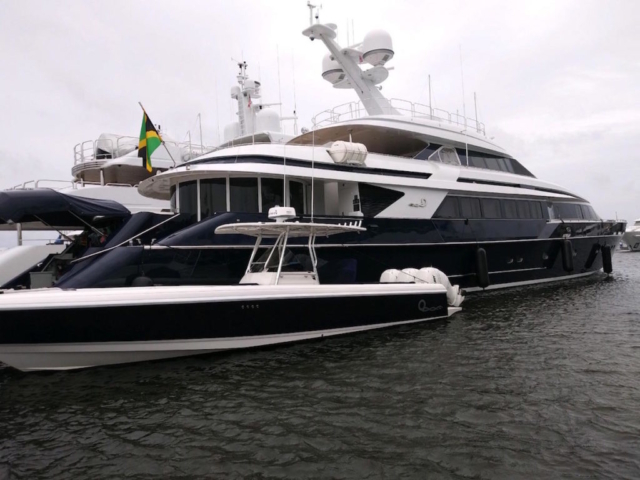 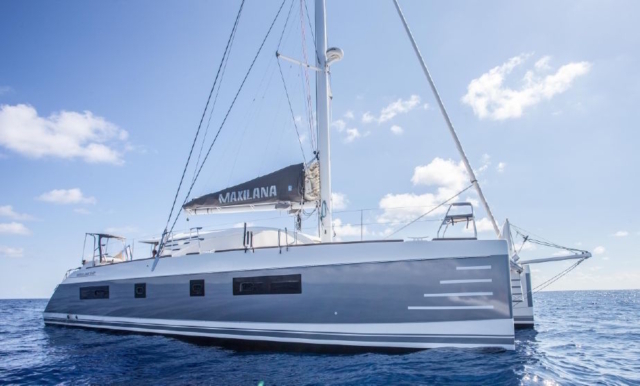 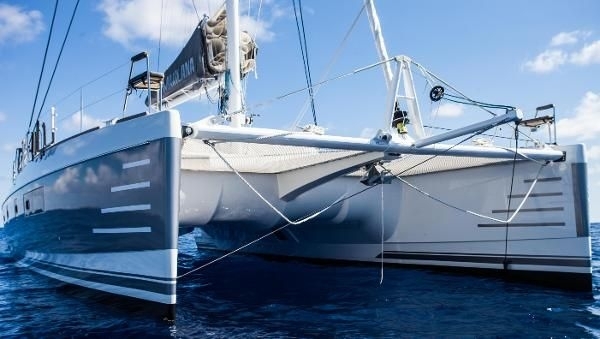 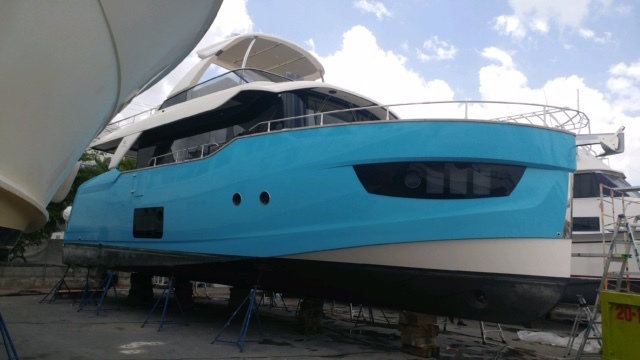 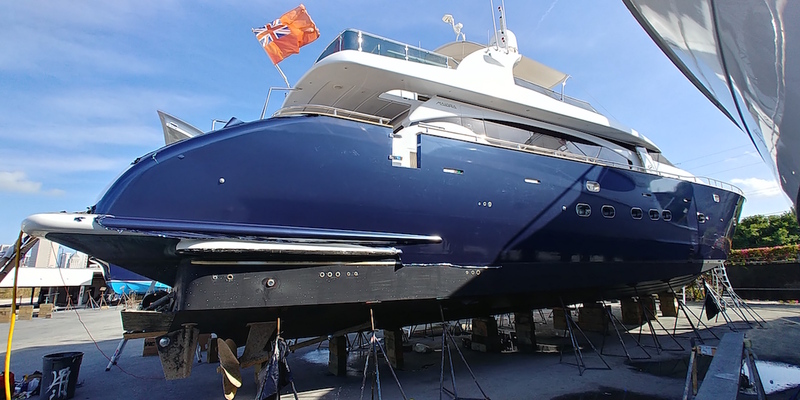 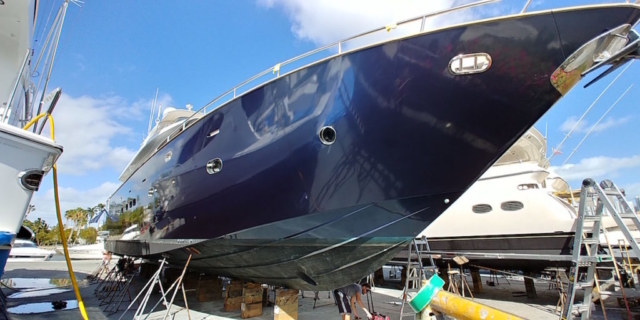 What types of Marine Vessels can be vinyl wrapped? 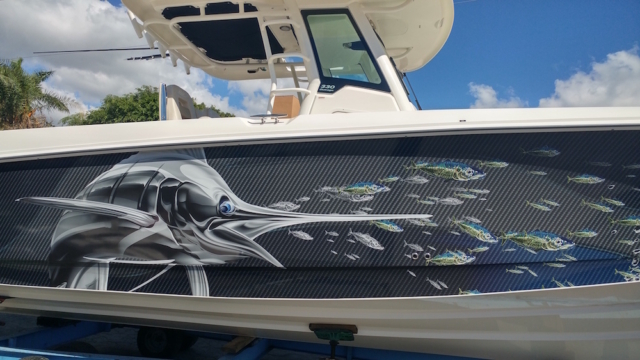 All styles of watercraft can be vinyl wrapped with print and graphics. Marine Vessels and boats can be wrapped with custom vinyl graphics, textures, prints, lettering, racing stripes, and large format graphics. 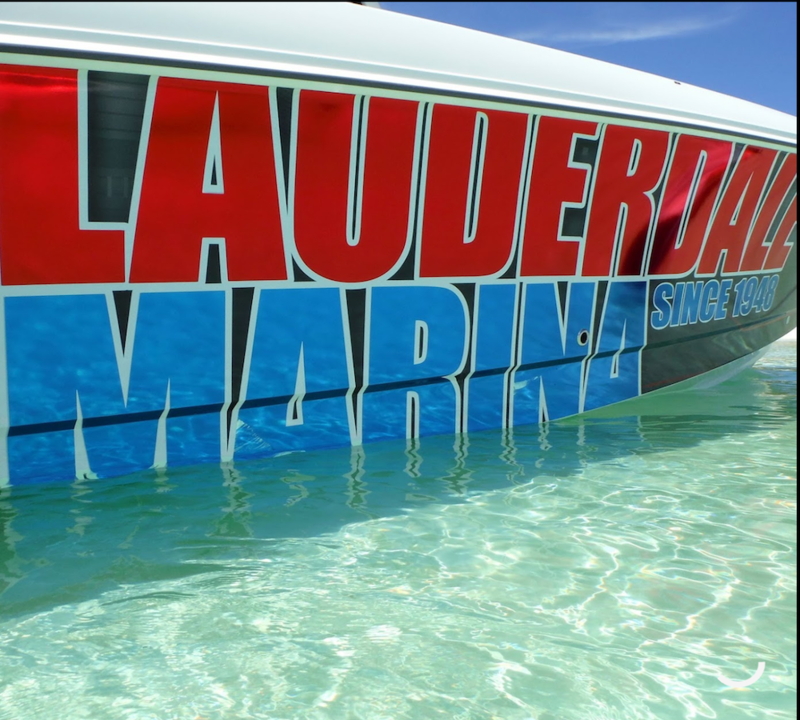 A boat vinyl wrap is perfect to individualize your personal yacht, boat, or jet ski, or to turn your boat into a floating water billboard. 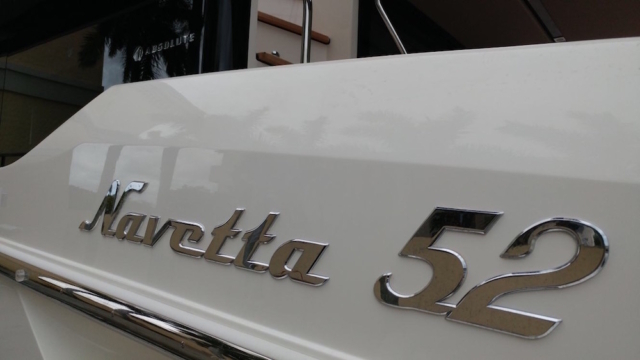 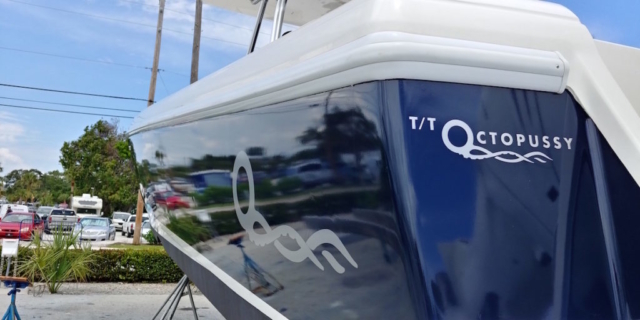 Customizing and branding your boat with your business information and logos, offers a unique and valuable way to market yourself or your business. 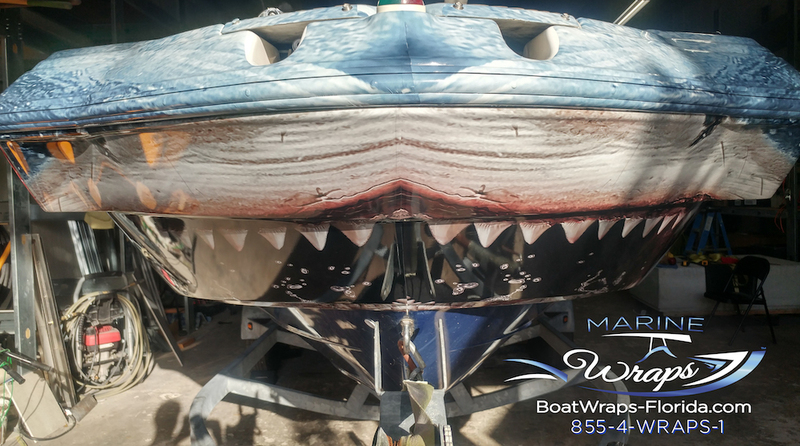 Boat wraps not only offer superior individualization and a strong advertising medium, but they also offer protection to your boat. Each person’s needs differ, based on why they are want their boat wrapped and customized with graphic wraps. 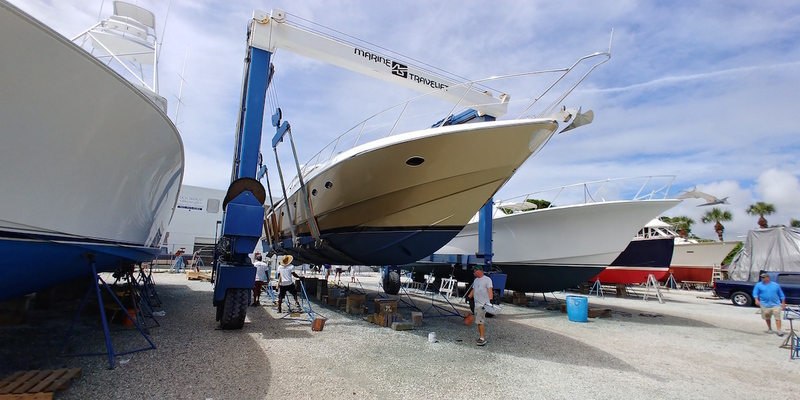 We work with our clients to deliver exceptional, artisan results specific to their needs. 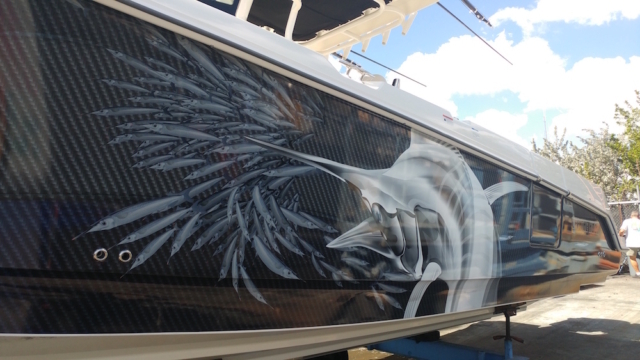 Our in house graphics team, printers and installer bring your boat wrap to life. For more information about a wrap for your boat, call us or fill out our quote form. 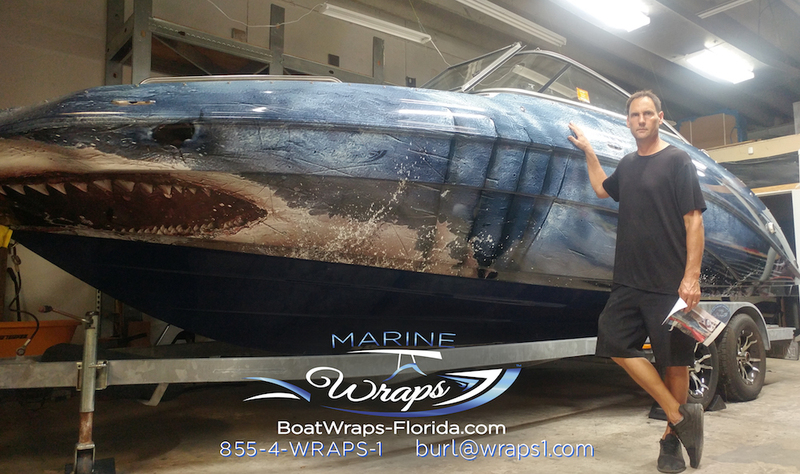 We wrap our boats with only the best vinyl wrap brands in the industry. Choose between a large selection of colors, textures, and manufactures. a vinyl film acts as a protection barrier from the water and harmful UV rays. Protect your boat from fading and unwanted scratches. 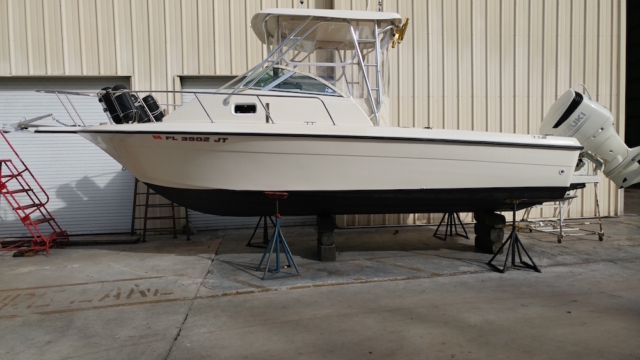 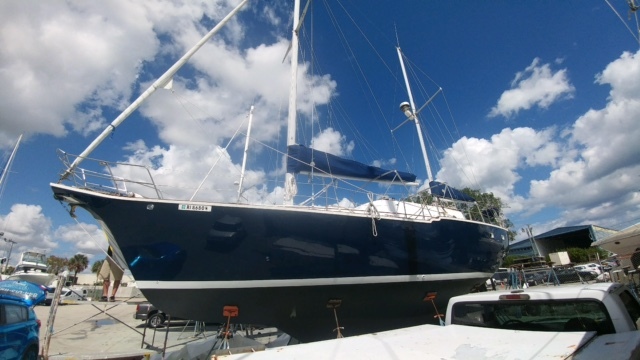 vinyl wrapping your boat or marine vessel offers a cheaper, way more cost effective solution to the traditional paint job. This is true for cars, trucks, and other vehicles too. 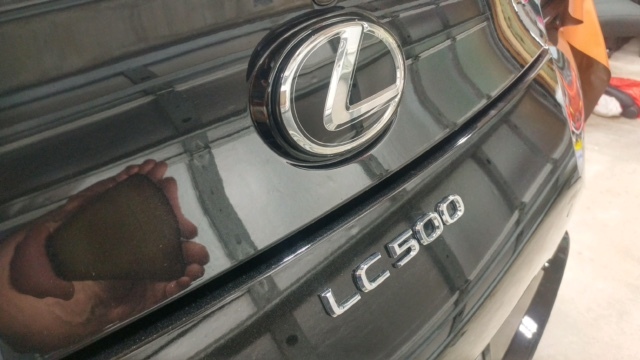 a vinyl wrap offers durability and protection. 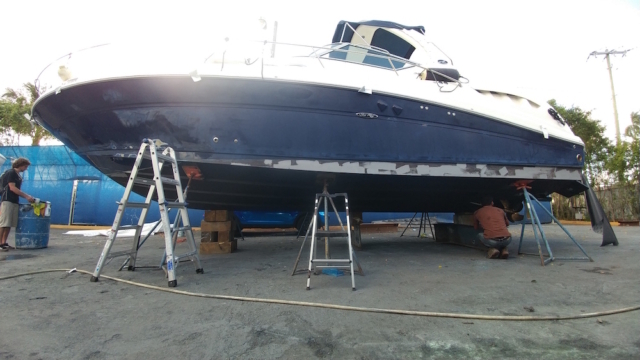 A wrap properly cared for can last up to 7 years. 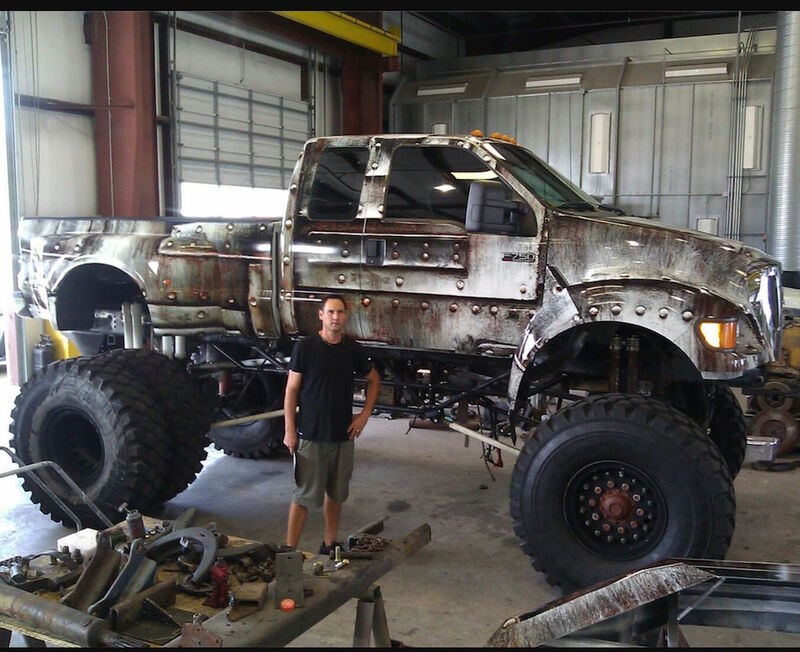 It can also easily be fixed or removed if need be. 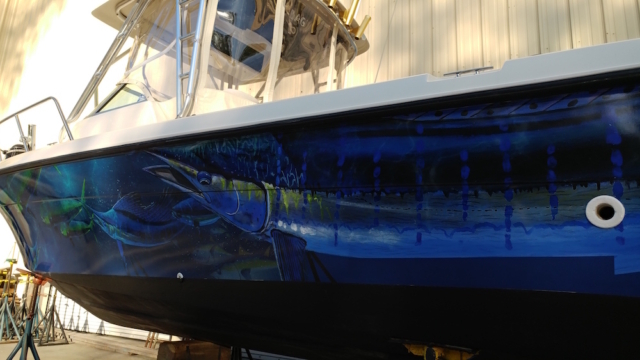 a boat wrap protects your paint or underneath gel coat. However, a boat vinyl wrap is easily removable and changeable, without creating any damage to your paint (as long as it’s correctly removed). Maintain your boats resale value and easily keep or remove the vinyl wrap. protect your boat or water vessel and maintain it’s value by adding a wrap. A vinyl wrap can be removed to restore boat to it’s manufactured appearance, or liven up a boat for resale purposes. Explore your vinyl wrapping and custom vinyl graphics for your Florida boat, and let us help.